Lisa and I talk about how she took the leap from paid employment to being a full time artist and what that means in terms of making work, selling work and spending time in the studio. We learn how Lisa came to be living in New Zealand and how that has impacted her art. 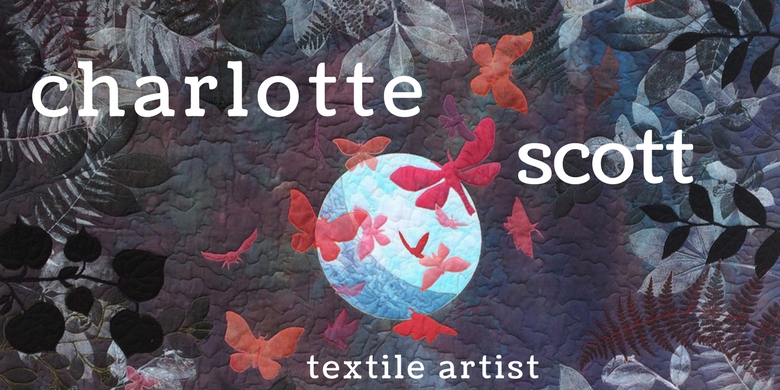 Lisa also gives us an insight into how the textile art scene differs between NZ and the US. We discuss what coaching is, why Lisa became a coach and how she uses coaching skills to teach students to be artists rather than teaching them how to make art. Lisa is next exhibiting her work at the 100 Days show at Tutere Gallery in Waikanae opening September 1st 2017. This will be Lisa's 100 black and white textile paintings incorporating her explorations in mark making that she has been making for her 2017 100 Days Project. 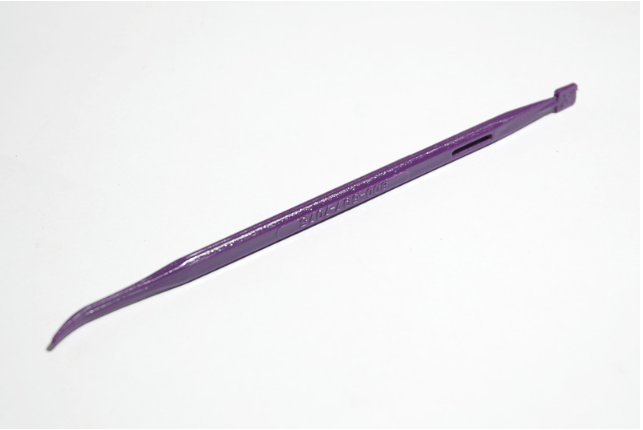 Lisa's favourite studio tool is her Purple Thang. And her favourite sounds to create to is Brandi Carlile and a little bit of Gin Wigmore. 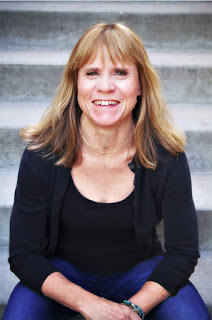 The conversation with Lisa was in-depth and profound, she was incredibly generous with her knowledge and time. I could have listened to her for at least another hour! 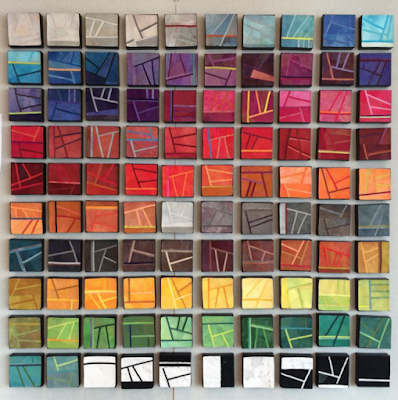 So grab a cup of tea and settle down and learn more about Lisa Call, Artist. I'm not a big one for buying fabric. 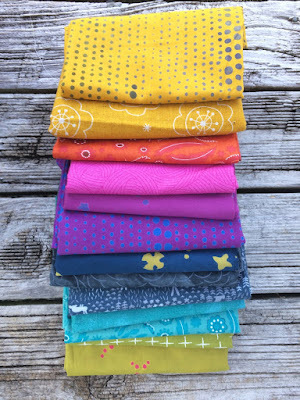 I used to be and, probably like all beginner quilters, I was pretty indiscriminate, buying anything and everything, especially if it was on sale. Now I make a lot of the fabric I use in my art - usually hand-dyeing and sometimes painting. 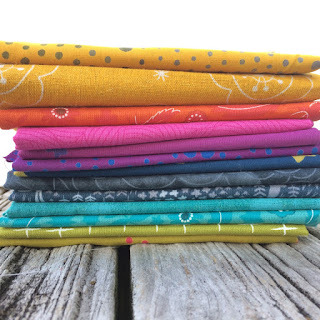 And I've culled my commercial stash over time down to fabrics that still appeal. I use them to make more traditional quilts, gifts, or functional items. But I still add to the hoard from time to time when something particularly calls my name. After all, I still love a beautiful fabric! 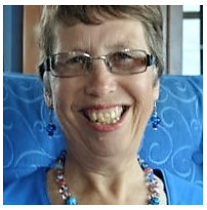 One of my quilting BFF's and I took a trip to two of our closest quilt shops (an hour long drive) recently when I had to get my machine serviced. Of course we browsed and of course I heard the siren call of some fabrics. 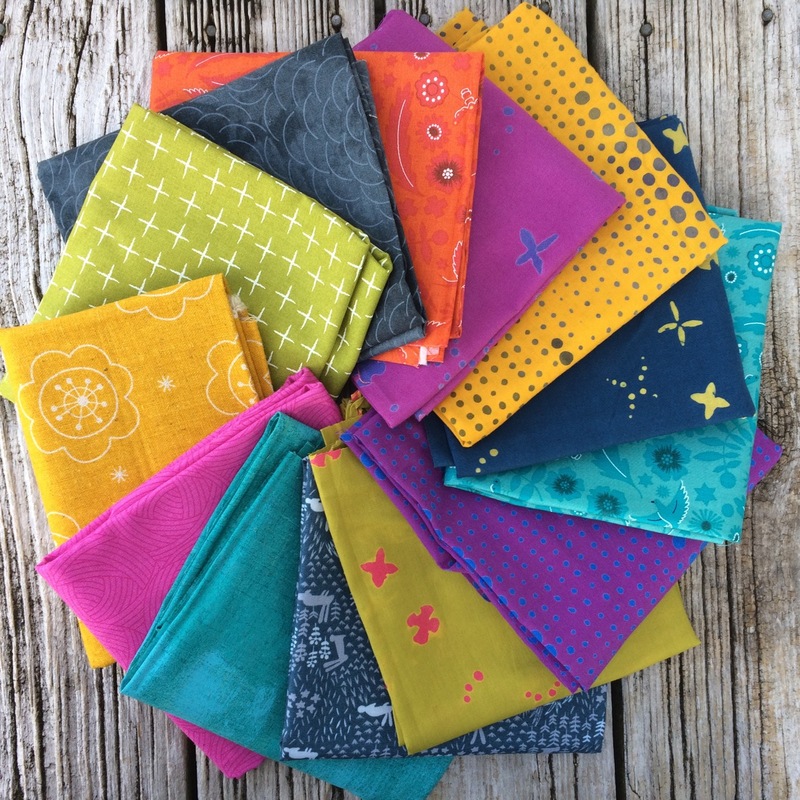 I think a lot of them are Alison Glass (but they are fat quarters so the selvedges are not always complete), there's a Moda Grunge fabric and the yellow flower print is a beautiful linen. 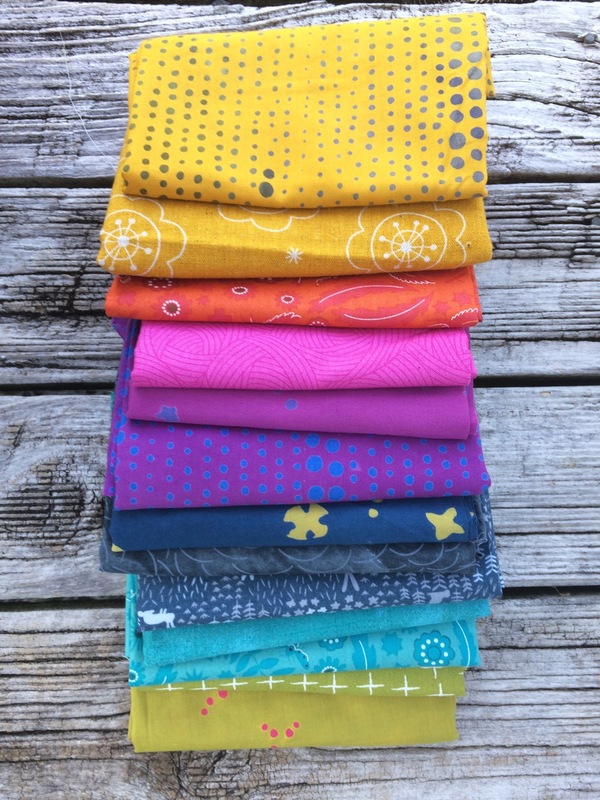 The Alison Glass fabrics caught my eye first and then I pulled fabrics to fit in with them, then added to the collection from the second shop. Playing with fabrics can sometimes take me hours, but this pile only took about 30 minutes to finalise. Something about it worked right from the beginning. And now I have to find or design a pattern to use them with. 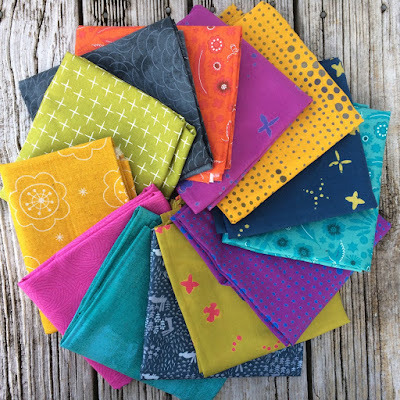 I've been looking at the quilt currently spread on our bed and thinking that it's time to change it up a little, and this collection will be perfect, as long as I can come up with the right quilt design. Something that makes the most of the fabrics. So, does anyone have any suggestions? I'm currently thinking 60 degree triangles, with some triangles big and some made of several smaller ones - varying sizes but all fitting together - if that makes sense. But if anyone has any other brilliant suggestions - let me know! 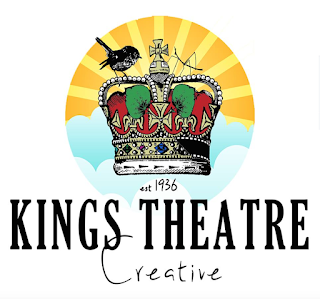 Kings Theatre Creative is a local creative community space and art gallery in Kawakawa, Northland (home of the famous Hundertwasser public toilets). 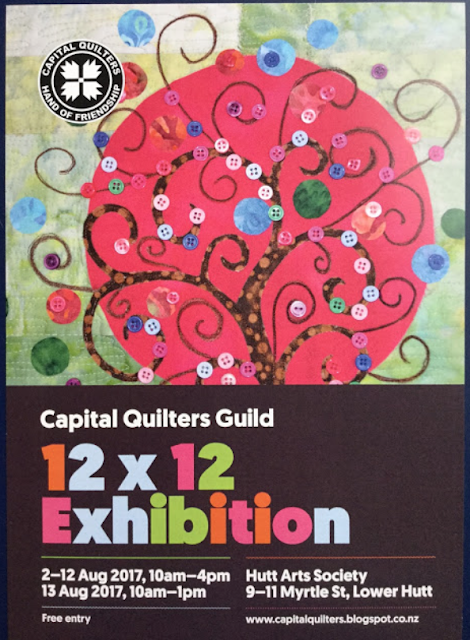 I've had quilts hanging there as part of their exhibitions, and sold at least three, woot!! As part of their Winter program they've organised some one-day creative workshops. One of them was Introduction to Screenprinting. I jumped at the chance to get a hands-on with a teacher who really knows the ins and outs of this technique, because I've dabbled in it a little on my own, but there comes a point where you really need proper instruction. 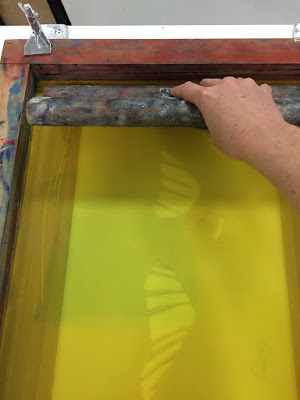 Jasmine was our teacher and she hails from Te Kowhai Print Trust in Whangarei - a facility with traditional and modern printing equipment and techniques, established to teach and support people of all ages in the art of printmaking. I had a blast and learnt so much! We started by having the process explained to us with a simple example that Jasmine had constructed. We watched her pull a print from one layer of stencil and it got us all itching to get stuck in. But first we all had to draw our own drawings and create newsprint stencils from that. I chose a cormorant drawing that I've used before in my quilts as an appliqué motif, but thought it would lend itself nicely to a screenprint stencil. 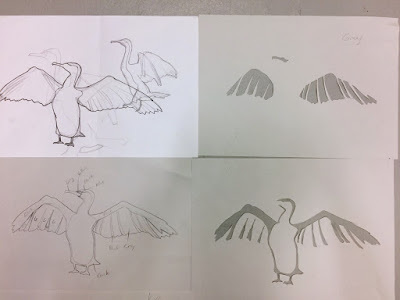 In the photo above, you can see the original sketch top left, then the tracing I took off it with colour notes bottom left, and on the right are two of my newsprint stencils. Then we were allowed to start printing! It was really interesting to see everyone's drawings come alive with the layers of stencils. 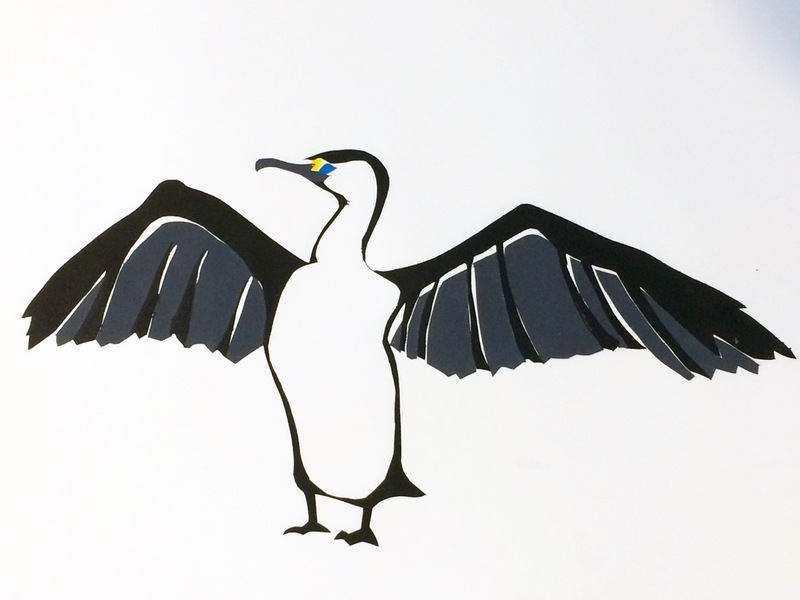 My first two stencils were of the tiny yellow and blue eye details of the cormorant so were not very exciting, but once I started layering on the wings and body, I couldn't stop grinning! I have a lot to learn and of the ten prints we made, probably only four of them are of a standard that I'm really pleased with. But not too bad for a first go! My quilty friend, Suz, pointed out that she can see a lot of influence in this from my 100 days of scissors and paper cutting project that I'm doing. And I agree. It's interesting how much unconscious crossover there is when you start comparing the different strands of your creative projects. So yay! I can see more screen printing in my future. In exactly what form I'm not sure, but now I know more of the ins and outs, I'm confident to try it again and continue my learning. I first met Bridget on Instagram and enjoyed seeing her modern quilting style and interactions with other Wellington quilters. 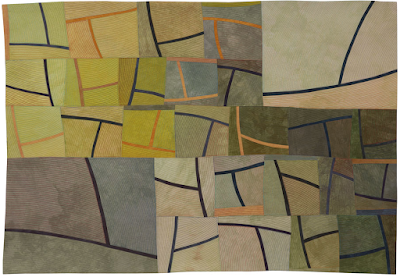 The photo below is one of Bridget's quilts that we discuss during our chat. 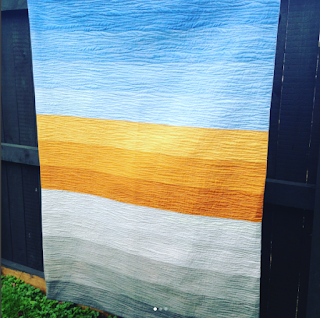 She uses her hand-dyed fabrics in such a graphic, modern way - I love it! The book we talk about is Modern Color by Kim Eichler-Messmer. Bridget used this book as inspiration when she has been experimenting with hand dyes. 157 quilts were entered by 50 members of the club - a fantastic amount of quilts and a great participation rate! The judge was Kirsten Duncan, one of the 'twelves' - a participant in the original 12 x 12 internet based art quilt challenge that resulted in the book "Twelve by Twelve: the International Art Quilt Challenge". We talk about a few of the quilts in the exhibition itself. The Best in Show winner was Lyn White with Light Show at the Museum. Bridget won first in the pink category with her 'not very pink' quilt. And she also won a merit in the reduce, reuse, recycle category with her painted doily quilt. Jan Nankivell (I hope I've spelt your name right, Jan), was the winner of the reduce, reuse and recycle category and used hundreds of pre-loved staples to create this image of the elephant! We discuss Adrienne Read's quilt in the bedazzled category with it's interesting fringe and fabric collage. The quilt below is one of my favourites - Lyndy Young's entry in the flora and fauna category. Such a graphic and striking image of her cat, Mr Marco. We also discuss Rayna Clinton's clever quilt that won the through the lens category.